As we were looking at the calendar considering all the comings and goings of various people, we realized that we were going to be the only missionaries on campus during our anniversary weekend. With that in mind we decided to postpone our celebration until at least one other missionary was on campus with us. Little did we know how full this weekend would be. Saturday morning began with checking on the toddlers. Many of them have colds which are called "cough and flu" here. Some of them were not eating well and seemed very weak on Friday, so I wanted to check in on Saturday morning to see how those little ones who I love so much were fairing. There seemed to be less coughing in the night which is a good sign that they are improving. Here is a photo of some of these precious kiddos out on their walk. On Saturday afternoon we had our scheduled chord group meetings. Due to many people being away and some miscommunication among the local staff, the first hour of these meetings was a bit crazy. 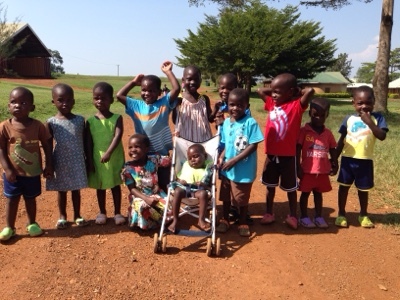 While we were waiting for other staff to arrive, David organized some soccer scrimmages among the boys. 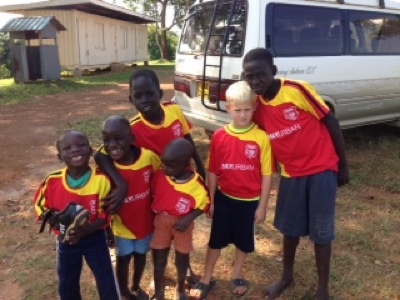 He used some of the jerseys that were sent back with us to organize teams, and the boys had a great time playing. Meanwhile, I was meeting with 2 groups of girls ages 6-12 or so. Due to a last minute emergency, I was meeting with all of these girls on my own. I had planned to do a bit of gymnastics with them before our time of discussion and prayer. I forgot that doing gymnastics with a dozen girls who don't have parents to watch would lead to a ridiculous amount of "Auntie Lisa, watch me!" After an hour of trying to watch every handstand and cartwheel, in addition to providing encouragement, instruction and assistance, I was absolutely exhausted. Thankfully, we were able to have some quieter time of praying for each girl's concerns/requests one at a time. This time with the girls reminded me how much they desire to be seen, known and loved. Please pray for us all at GSF to know how to care for these children well. When the chord groups were over the boys of GSF who are Elijah's age and older challenged the boys and young men in the village to a soccer match. The GSF team gave a great effort, but they were generally much younger than the young men from the village who controlled the match. In the evening we were in charge of the teenagers of GSF watching a movie. The once a week selection process can take some time, but they eventually decided on one, we made and ate pizza as a family at home and crashed into bed fairly exhausted. Since the other missionaries were away, we had many responsibilities on Sunday. 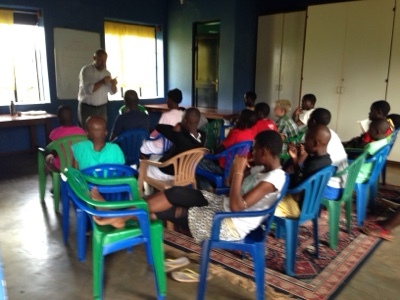 David taught the two oldest Sunday school classes from the book of Jonah. After cleaning up from breakfast and doing some preparation for lunch, I went down to sit in the class. Sometimes I forget what a great teacher David is. It was great to be able to sit in as a student. I was thankful that these kids are getting such good biblical instruction. After Sunday school at GSF, we picked up the GSF kids who are not able to walk to church and drove together. Of course we often add several children while passing through the village. We sometimes call our vehicle the "church van." As we were going to church I realized that one of my neighbors was very ill. She did not have any medicine, but I knew I had medicine that would really help her at my house. My first inclination was to just keep going and get her the medicine after church. Then I thought, "Why would I leave her suffering for 3 hours just so that I can get to church 5 or 10 minutes sooner?" I got out of the church van and walked back home to get some medicine for her. David went on with the van fun of our 4 children, the 3 children from GSF with special needs, and 5 children of our neighbors who have begun attending church with us. One of the things that I love about my husband is his heart of service. He was happy for me to help our sick neighbor and take the 12 children on his own. After praying with my neighbor and giving the medicine to her, I walked on to church. At church we have both taken on some new responsibilities. David has been asked to serve as an elder at Light of the World church and to be the treasurer. I have been asked to coordinate Children's church. We have a rotation of a few different church members willing to teach, but this was my first week. Here in the village many children come to church without their parents. Children's church is an opportunity to teach the Bible in a way that these kids can understand. One of the challenges is that this group of about 30 children ranges from babies up to 9 year olds and they have 3 different primary languages. I enjoyed working with the children on singing "Jesus loves me" in all 3 languages. Please pray that these children will know the truth of the gospel and want to live their lives for God. After church, we waited while David worked with a few others counting the offering and then drove home. I stopped to check on our sick neighbor and found that she was already feeling a bit better; praise God. When I reached home, a woman from the village was there waiting because I had offered her a pair of my extra shoes. They were a bit small for her, but she was sure that she could make them work. David took the children back to their houses, and at about 1:30pm we got back to finishing lunch preparations. We had a Ugandan friend and her fiancé coming over for lunch. It was great to get to know them a bit better. They also talked with us about some of the differences in various tribal customs. We are always learning more about Uganda. They also asked us about what has kept us married for 18 years. The answer is the grace and love we have received through Jesus. We have learned much about forgiving and being forgiven through these 18 years. When our lunch guests left, we thought we might have a few hours to rest before our next scheduled event. Instead we had a few young men come by the house to talk with David asking for work during their school holidays. He usually hires some guys to help with their school expenses and supervises them doing various landscaping projects. It provides another outreach/discipleship opportunity, but it also requires time. On the first Sunday of every month we have GSF family church for the children, house moms, and missionaries who live here. This Sunday evening David led our time of worship, testimonies, prayer and Bible study. By the end of our anniversary we fell into bed exhausted! It was a wonderful weekend full of opportunities for ministry, but it certainly wore us out. This weekend we have found someone to watch our kids so that we can get away for a lunch date and a trip to a roadside nursery. In America, we would often go to a garden center on dates. Gardening is a hobby we have enjoyed together throughout our marriage. The roadside nurseries here look very different from American garden centers, but the plants are still beautiful and much less expensive. Of course, it often requires haggling over prices, language challenges and other adventures, but we still love it! We are thankful that God has blessed us with 18 years of marriage, teaching us much about His grace throughout.